As many of you know Cincinnati’s MadTree Brewing very recently expanded their distribution to reach the Columbus market. 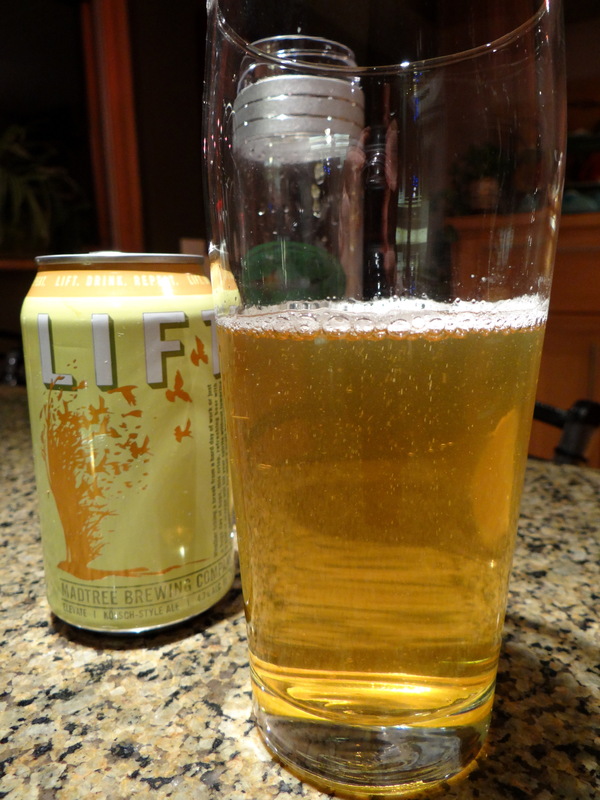 So when buying beer for a party I was hosting this past weekend I decided to pick up a 6-pack of their Kölsch, Lift. I figured it would be an easy drinking beer that anyone could enjoy. When Sunday morning came and there were a couple of cans of Lift left over I decided this was the perfect opportunity to try out my Randall Jr.
At this point some of you might be asking, what the hell is a Randall Jr? Is that the Eagles new quarterback? No. Is that the brand of amplifier that Kirk Hammett of Metallica uses? Yes, but that’s not the point. The Randall Jr. of which I speak is a contraption that Dogfish Head created to infuse your beer with flavors of other ingredients, like fresh hops, herbs, fruits, spices, etc. It’s basically a clear plastic thermos with a screw on wire mesh top, and a lid that screws on over the wire mesh to seal in the carbonation. To use it you simply add your beer and infusing agents to the vessel, screw on the mesh top and lid, put it in the refrigerator and wait patiently while the infusing agent does its job. Dogfish Head recommends you let things infuse for 20 minutes, but online you can find recommendations ranging from 10 minutes to an hour. When you are ready to drink the concoction you simply unscrew the lid, pour the beer off, and let the wire mesh filter off the non-beer flavoring agents. It’s similar to a French press, without the pressing part, so if you want to try this at home and don’t have a Randall Jr. feel free to improvise with a French press. So on Sunday afternoon I went to the store to pick up a vanilla bean and some oranges. It’s worth pointing out that vanilla beans are pretty damned expensive, $11 for a spice jar with one long Madagascar vanilla bean. Not knowing how much of either ingredient to use I opted to slice off a segment of the vanilla bean about 1” long, followed by two orange slices. I then screwed on the lid and put the Randall Jr. in the refrigerator to do its magic. The dark rectangle near the top of the liquid is the vanilla bean. Before describing the flavor of my infused concoction let me say a few things about what Lift tastes like without anything added. I like to think of a Kölsch as the ale equivalent of a Pilsner, as both styles are easy drinking thirst quenchers that are often labeled lawnmower beers. MadTree’s interpretation fits that profile to a T. Slightly sweet bready malts are the star of the show here, accented by very subtle fruity ester notes. The brewer’s description on the can suggests that the fruit flavors are orange, but to be honest the fruit highlights are too faint for me to identify the flavor. There is little to no hop aroma or flavor. It’s an easy drinking, low abv (4.7%) beer that has enough malt flavor to appeal to the craft beer drinker while still remaining sufficiently accessible that your Budweiser-swilling uncle would not say no to a second can. I might like a little stronger fruity ester presence, but overall it’s an enjoyable beer to drink. 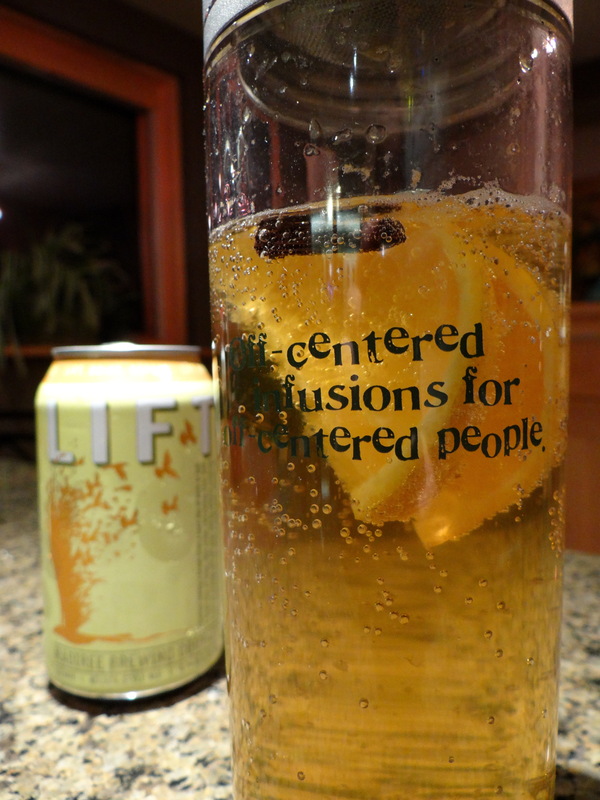 If you are trying to hone your ability to describe beers and you want something to demonstrate bready malt flavor look no further than Lift. After waiting for a dozen or so minutes I figured it was time to see if I had indeed achieved my goal of creating a dreamsicle in a glass. The first thing to note is that a small hiss of CO2 was audible on screwing off the lid and there was a fairly lively carbonation on pouring, though not much head as you can see in the picture below. This suggests to me that I could have infused for longer without much danger of the beer going flat. The orange aroma and flavor of the infused beer is unmistakable. If anything I might have overshot a little on the orange, maybe one slice of orange would have been sufficient. Although I should point out that the orange I used was very juicy, in fact I later learned that what I thought was an orange was actually a tangelo. Hence the citrus notes lean strongly toward a tangerine. The vanilla is more subtle but it is there if you look for it. To hit the sweet spot of a dreamsicle one might like a touch more vanilla. Still fairly carbonated at the end of the infusion. Was the experiment a success? It did have the flavors of a dreamsicle, but if I’m honest it was missing the creamy flavor and texture of the real deal. Also the acids that come from the orange/tangelo clash a little with the malts, but on the other hand it was far from a disaster. In fact I’d have to say I thought the infused beer was just as good and a little more interesting than the base beer. I’m sure if you infused with a firkin or used Randall Jr.’s big brother, Randall the Enamel Animal, the final product could easily be closer to the mark. If you’ve tried this at home I’d love to hear your experiences. Do you have any tips for improving on my recipe? Maybe infuse a little longer, or use more vanilla. If you’ve not tried this, but are a fan of a good dreamsicle, give it a try and let me know how it turns out. If you want a more conventional introduction to MadTree I’d suggest starting with their excellent IPA, PsycHOPathy. You can check out my review from last winter by clicking here. The result was pretty close to spot on for the flavor of a dreamsicle, so I would strongly advise following this recipe. Impressively I was still able to get 1 finger head after the longer infusion time. While the taste says dreamsicle, the mouthfeel still says light bodied beer. It would be worthwhile to see if there is a heavier, creamier beer that could be used in this recipe. My best success with Randalling vanilla beans is using a whole bean and splitting it open down the middle to allow the powder to interact with the beer. Give that a go if you have anymore Lift left. I did slice the bean down the side to open it up, which I think helps. I would think that it might be overpowering to use an entire bean, plus it then becomes a $13 glass of beer, which is a bit steep. Using more bean and letting it infuse for a longer period of time seems like a step in the right direction though. I do have one can of Lift left so I’ll try a follow up experiment to see if I can improve on my first attempt. Tom I went back for a second try and the tweaks I made brought it pretty damn close to the dreamsicle flavor, see the addendum I added for the details. Thanks for your suggestions.